MINNEAPOLIS, Minn. — Former Minnesota Vikings great, Cris Carter, returned to Minnesota Thursday, Nov. 7, to be honored at halftime in a ceremony that presented him the Hall of Fame ring. When Carter was presented the ring by the official from the Pro Football Hall of Fame, he proudly slipped it on his finger, staring long and hard at it. 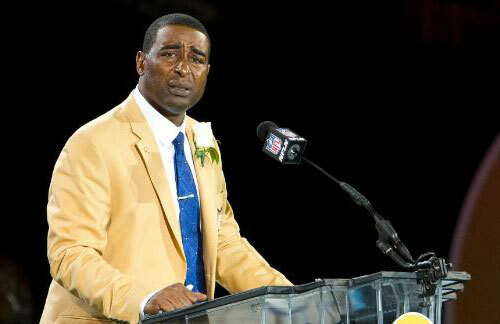 Photo shows Cris Carter delivering his Pro Football Hall of Fame Speech. Carter is best remembered for his career with the Minnesota Vikings from 1990-2001. He also played wide receiver for the Philadelphia Eagles from 1987 to 89 and later the Miami Dolphins in 2002. Carter had a dark period during his time with the Eagles and admitted that coach Buddy Ryan released him because of alcohol and drug abuse. He credits his former coach with helping him turn his life around as a result. On September 4, 1990, Minnesota claimed the troubled wide receiver off waivers and in 1991, Carter became Minnesota’s top pass catcher, leading the team with 72 receptions, 962 yards, and 5 TD catches. Since retiring from the NFL, Carter has worked as an analyst on HBO’s Inside the NFL, ESPN’s Sunday NFL Countdown and Monday Night Countdown, and online at Yahoo Sports. He currently serves as a NFL analyst for ESPN. If you would like to book athletes like Cris Carter for a speaking event, appearance or endorsement, contact our booking agent for appearance and speaker fees at Sports Speakers 360 or call 1.855.303.5450.